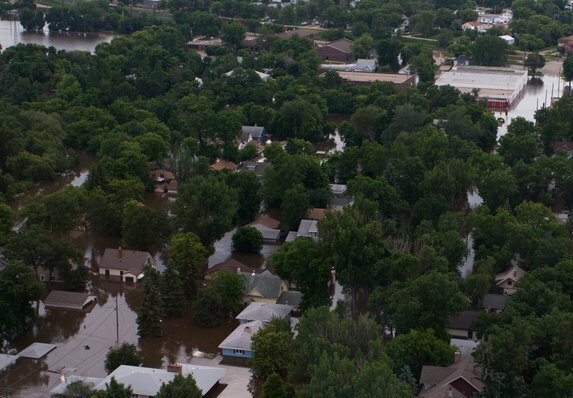 I recently returned from a visit to my in-laws’ home in Minot, North Dakota where I saw first-hand the devastation caused by last year’s spring flood. What was once a middle-class, suburban neighborhood located next to the city park and zoo, is now a depressing sight of mostly empty homes, some stripped down to the frame work, piles of debris still sitting curbside waiting to be picked up, and once manicured lawns full of weeds and dead shrubbery. Many businesses remain boarded up. This area was considered a Moderate-to-Low Risk flood exposure by the Federal Emergency Management Association (FEMA). What does that mean? In Moderate Risk areas, the indication is that a flood is not likely to occur more than once every 100 to 500 years. It may also indicate the area is protected by levees from 100-year floods. Prior to 2011, the last flood in Minot had been in 1969. New levees were built and people were assured that they would never experience a flood like this one again. Yet the water rose nine feet higher in June of 2011. Less than 400 of the 4,000 homes that were destroyed were covered by flood insurance. Federal disaster assistance is usually a loan that must be paid back with interest. For a $50,000 loan at 4 percent interest, your monthly payment would be around $240 a month for 30 years. Compare that to a $100,000 flood insurance premium, which is about $400 a year or $33 a month. If you live in a Moderate-to-Low Risk area, your flood insurance premiums may be as low as $129 a year. In a High Risk area, your home is more than twice as likely to be damaged by flood as by fire. People in Moderate-to-Low Risk areas file over 20 percent of NFIP claims and receive one-third of disaster assistance for flooding. Almost 40 percent of small businesses never reopen their doors. By the way, my father-in-law is a very smart man and was one of those with flood insurance on their home. The water had collapsed three of their basement walls and rose over the tops of their kitchen counters on the first floor. Without insurance, it would have been unlikely they could have saved their home. Please call your agent and ask them to quote flood insurance for your home or business. It takes 30 days after purchase for a policy to take effect, so it’s important to buy insurance before the floodwaters start to rise. Have you suffered through a flood? Did you have insurance? I’d like to hear about your experience. How can I tell if I live in an area that is “Moderate-to-Low Risk flood exposure”? Great question! Just go to http://www.floodsmart.gov and enter your address in the red box. You will find all kinds of useful information including some estimated costs for flood coverage on your home. Thanks for asking! I have learned result-oriented things through the blog post. One other thing I have noticed is that normally, FSBO sellers will reject anyone. Remember, they would prefer not to ever use your expert services. in contact for four to five weeks, you will usually be capable to win interviews.